Private sea access, space and tranquillity. La Fenice sits in a glorious position on one of the most beautiful parts of Sicily’s coastline. Comfort coupled with peace and quiet and private access to the crystal clear waters below make this an ideal choice for a good relaxing holiday. And with the restaurants and shops of Scopello within easy walking distance, you may find your hire car gets little use. ³ there is a mini-market with an outstanding deli, butcher's and wine section, a good bar, and an organic farm shop selling superb fruit and vegetables just a 10-minute walk away. There are also some good restaurants in the village of Scopello, about a 20-minute walk away (uphill). Please note that there are no pavements along the road up to Scopello. Inside: accommodation at La Fenice is spread over two main floors. The front door takes one into an entrance hall, off which, to the right, is the well-equipped kitchen with breakfast table and pantry. On the left of the hallway is the first bedroom, a double with en-suite shower room. A few steps lead down from the entrance hall to the airy, voluminous living and dining area, which is on two levels and features triple-height ceilings. On the upper level is a large dining table, a couple of armchairs and direct access via a shady portico to a fabulous sea-view terrace. A few more steps lead down to the lower level of the living area, which has a fireplace, two sink-in sofas and access to the surrounding gardens. A curvaceous flight of stairs leads from the upper level of the living area to the first floor gallery (also accessed from the entrance hall) with a sitting area and French windows opening onto a panoramic sea-view terrace. The gallery leads to three more bedrooms: a large master bedroom, with lounge area, fireplace, sea views and en-suite bathroom with tub, and two double-twins one with an ensuite shower room and the other with its own adjacent shower room and views over the gardens. Outside: La Fenice is accessed via a long private driveway through the wooded grounds. 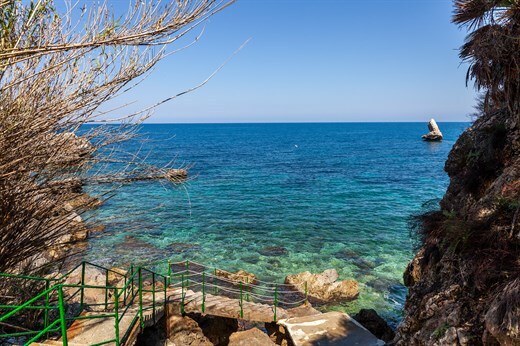 There are several terraces surrounding La Fenice, two of which offer glorious views of the sea and the rugged but idyllic coastline that so characterises this part of Sicily. The first, just off the indoor dining area on the ground floor, also has a shady portico where you will probably take most of your meals. The second is accessed from the first floor gallery. On the other side of the house is an area of garden and a covered al fresco living area from which one may join the gentle steps leading down to the transparent waters of the Tyrrhenian Sea. La Fenice's private sea access is relatively easy thanks to the presence of an underwater bathing platform in a small protected cove. The water in the area is particularly clear, and perfect for snorkelling and swimming. There is a nice pebbly beach with lido just up the road at Guidaloca. Set on the edge of the Golfo di Castellammare, La Fenice occupies a very private spot on one of the most beautiful stretches of coastline in Sicily. "La Fenice has amazing views and a great setting. The house was well designed and very comfortable." Beautiful location, lovely spacious property with particularly attractive upper terrace and outside dining area. Lots of kitchen equipment. Our holiday was all easy, enjoyable and La Fenice was fabulous. I loved your service. The private sea access at La Fenice was wonderful - it felt very decadent. The owner greeted us with a wonderful spread of food - she'd even made a cake for us which was very kind. The deli along the main road was fabulous and we really liked Scopello. We particularly enjoyed having our own beach! Crystal clear water and surprisingly decent temperature in the water. The location of La Fenice was great and convenient to the charming towns of Scopello and Castellammare del Golfo. The house felt very private. It was also not too far from the highway so less than an hour to some major sights. We enjoyed the private water access and the picturesque faraglioni and pristine waters below the villa. The mini market nearby had a fabulous selection of meats, cheeses, pastas, groceries wine, etc. Truly everything you could possible need. La Fenice is a mix of old and new. Everything hit our expectations. Scopello is a lovely place as well as the tonnara and I don't think you could get a better setting. La Fenice was fabulous on every level. Beautiful old style villa. So good to see something that is not full of rectangular swimming pools , perfect matching everything! Someone with an educated taste that does not need to impress Location, location! Great find. La Fenice has amazing views and a great setting. The house was well designed and very comfortable. The house and access to the sea was amazing. La Fenice matched our expectations and the sea access is beautiful. La Fenice was wonderful and we had a really excellent and relaxing holiday. Top class destination and service. The location of La Fenice is quite spectacular. We thoroughly enjoyed the terraces, particularly the upper terrace as it was warmer there. The experience was wonderful overall... Scopello is a hidden gem. La Fenice was in a beautiful setting, the view from the upper terrace was fantastic. It had everything you could possibly need and was extremely comfortable. What I enjoyed most about visiting Sicily? A cigar looking out from the villa at the lovely sunset. We really had a great time in a lovely house (in which we really felt at home) in a wonderful setting!! Everyone in our group of 8 enjoyed our stay for 100%!! The setting and location of our house were perfect. The house is well-equipped and we especially appreciated the ample supply of beach towels. We had my 2 grandchildren with us and it was their favorite holiday ever. They loved the swimming, the nearby market in Scopello with wonderful fruits and vegetables, and the piano in the house... In villa cook was fantastic - one of the best meals we had in Sicily! They were lovely people who welcomed us and made us feel at home immediately. Not only a wonderful house, but a fabulous base to explore Palermo and the western part of Sicily. Swimming better than expected. La Fenice is spacious and has great views. We had a really nice holiday. Just lovely…….Many thanks an all round lovely holiday. We were very happy with our accommodation and with the service of your organization from beginning to end... Highly recommended.